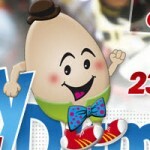 Oct 23rd sees Humpty Dumpty Duathlon coming to town start time of 12 noon. Anyone who is not participating and who can spare a few hours on Saturday from 11am to 2:30pm for marshalling, your help would be greatly appreciated. Please contact Tony on 087 8385798. The Rugby Club came up trumps for us with a huge number of helpers for the Little Bo Peep so anything we can do to return the favour would be great. Best of luck to all involved.